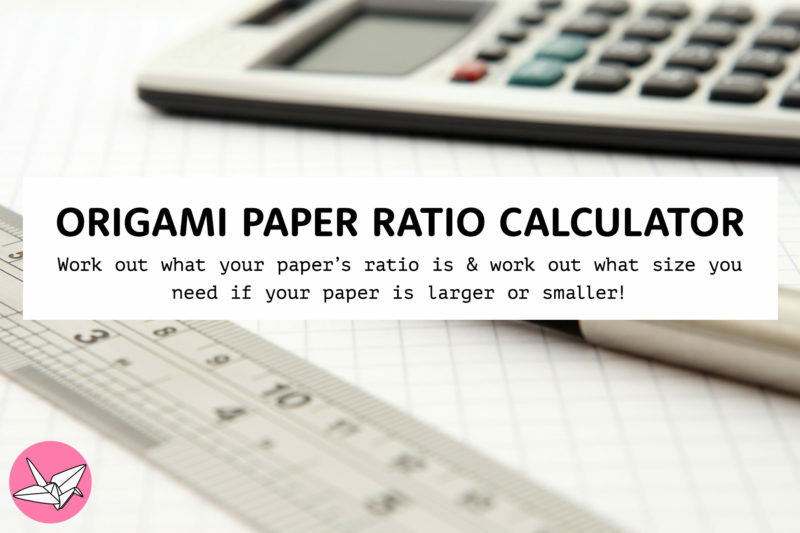 What is the Origami Paper Ratio Calculator? So the origami model you are making requires A4 paper or money sized paper? But you don’t have that size, you want to work out what size to trim your paper to, in order to fold the origami model? Or the origami model requires a certain ‘ratio‘ such as 1:2 and your brain hurts at the thought of figuring out what that’s supposed to mean. …Or – if you need to figure out what the ratio is – of your paper or anything really, you can find out what it is, for your own origami project or maths etc. Enter the size of the paper that is used in the tutorial. Alternatively, add the ratio, such as 1:5. For example, if the tutorial used A4 paper (21cm x 29.7cm), enter 21 and 29.7 into the fields. The Shortest Edge box is only useful if you are for example, making an origami lampshade from a roll of paper, you have the short side of the paper, and you’d like to know what length the paper should be trimmed to. If for some reason the result you get is wrong, please check that you followed the instructions correctly, and entered the ratio into the right boxes, the first box is for the first (shortest) number of the ratio, i.e 1:8 – 1 goes into the first box. Learn how to fold a pretty origami box in the shape of an egg. This openable origami egg makes a perfect gift box at Easter. It can also be a dragon egg, or other oval container. Learn how to make a pretty origami egg decoration for Easter. This origami egg is made with just one sheet of square paper, no glue or cuts required. I’m pleased to present my first origami book – ‘Kawaii Origami’, which includes over 25 cute origami projects ranging from easy to advanced. A long origami tray to keep pens, pencils or other items. This long origami box has handles on either side, easy to make, no glue required. Learn how to fold an origami box that looks like a pokeball on top! This octagonal origami gift box and lid is perfect for Pokemon and Pokemon Go fans. Learn how to make a fun magic origami spring toy. This accordion type origami gadget is addictive to play with, impress your friends! this is finally working – thanks so much. I have been trying for hours to figure it out. You will receive a special coupon code to get 50% off – as well as post updates, other freebies and more! No spam guaranteed!